John Carpenter's 'Big Trouble in Little China' is finally chop-sockying its way to Blu-ray, with Fox alerting retailers to an early-August release for the cult classic. Though a box office bust upon first release, the Kurt Russell martial arts-action-fantasy has since amassed one of the most devoted cult followings in history. Fox will give the much-beloved 'Big Trouble' it's first-ever high-def release on August 4. There are no tech or supplement specs at this early date, but a package comparable to the previous special edition DVD release is hoped for. We'll keep you posted. Suggested retail price for the Blu-ray has been set at $29.99. 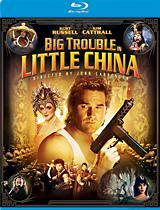 You'll find the latest specs for 'Big Trouble in Little China' linked from our Blu-ray Release Schedule, where it's indexed under August 4.